Blues Riff is one of the best crack climbs in Tuolumne. In the winter of 1998–1999 a gigantic block forming one wall of the first pitch 5.10a ow fell off, but an alternate face climbing variation was established soon thereafter. 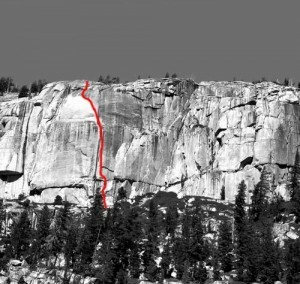 The 140-foot-long crux pitch was undamaged by the rockfall. The endless, slightly overhung endurance liebacking and hand jamming of this pitch is an awesome pumpfest. Which SuperTopo guidebooks include a topo for Blues Riff?